We believe we're stronger together! The Society for Health Communication is a member-driven organization bringing together health communication professionals, students, and scholars from the diverse areas of teaching, research and practice. We connect individuals working in public health, healthcare, medical communications, digital health, health communication research, and academia in order to create new relationships and share knowledge. 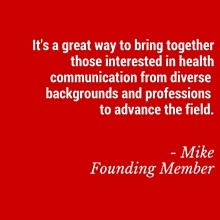 By uniting our members, we're building a unified voice to shape and advance the field of health communications. We are an international organization, based in the USA, serving members from all countries.